Detect direct debit frauds in a timely and efficient way! Electronic alignment of Direct Debit (DD) transactions is a key business function of modern banking systems. In a DD financial transaction, one party withdraws funds from another party’s bank account (both parties can either be a company or a person). The party receiving the funds is called “the payee”, the one being charged is called “the payer”. To set up the process, the payer must advise his/her bank that he/she authorizes the payee to directly draw the funds from a specified bank account belonging to him/her. DDs are available in a number of countries, where they are made under each country’s specific rules, and are restricted to domestic transactions. There are generally two methods (which can be possibly combined) to set up the authorization: 1) One method involves only the payer and the payee, with the payer authorizing the payee to collect amounts due on her account; 2) The other method requires the payer to instruct her bank to honour direct debit notes from the payee. The payee is then notified that she is now authorised to initiate direct debit transfers from the payer. After the authorization has been given, the payee can instruct his/her bank to debit an amount directly from the payer’s bank account. The payee’s bank account and the payer’s bank account are at two different banks. 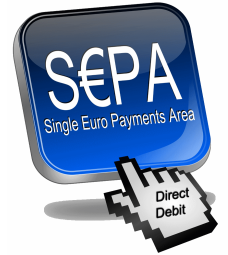 Once the process is set up, the direct debit transactions are processed electronically. In many cases, in addition to the payee’s bank and to the payer’s bank, there is also a third bank, called the “Aligning Bank” (AB), acting as a mediator. In Italy, the AB is a single bank, it cannot be a Clearing House. The use case focuses specifically on the data exchanges handled by the AB. We will consider bidirectional transactions related to banking processes that manage automatic payments by DD and basic available functions/services. These involve two main data flows: a) Data flow from payee to AB; b) Data flow from AB to payee. The payer can cancel the authorization for a DD payment at any time. Additionally, the banker can decline to carry out a DD transaction if the transaction would breach the terms of the bank account out of which payment is to be made (as an example, this may happen if the transaction were to cause the account to overdraw, since banking law does not authorize a bank to alter the amount). DDs are massively used for recurring payments, and in particular utility and credit card bills. A major risk factor lies in the fact that the authorisation that is given – i.e. the circumstances in which the funds can be drawn – are a matter of agreement between the payee and the payer, of which the bankers are not concerned. Even in countries where a number of controls are enforced on the authorization set up process, the problem of direct debit fraud is extensive. Timely detection of frauds and failure scenarios. Powerful event correlation and alerting to deliver increased situation awareness with respect to attacks to and/or failures of the business process. Exploitation of different technologies used in the financial domain for data management SQL (for querying), NoSQL (for storing), and CEP (for correlating and filtering events) eliminating ETLs.